Not every lens has content that can achieve Squidoo tier one. I have some lenses that aren’t going to get above tier 3, or if they do, it would take tons of social promotion, and they’d drop back down as soon as I stopped. So when I selected a lens to submit to the Tier One Challenge, I looked carefully for one with the potential to do better. I needed a lens where I knew why it wasn’t succeeding, so I knew how to improve it. Why it wasn’t succeeding: quiz module content is not indexed by search engines, and it had little else besides pictures, so it was getting no search traffic. Why it might succeed: Its topic satisfies 5 separate, overlapping searches/audiences: mythology, trivia quizzes, Athena, pictures, and paganism. The topic had the potential for clickthroughs and interaction, and maybe the odd sale. Also, it’s in my primary niche. I have other lenses, blogs, a messy collection of sites and nodes I’ve scattered across the web that can be tapped for traffic and promotion. Squidoo ratings and social promotion are great, but they are not enough to keep a lens in tier 1. A lens must be self-sustaining. So now comes work. LOTS OF WORK. What have I done so far to improve my test lens’ chances? I started with a massive redesign: following the quiz module, I added images and information explaining and illustrating the answers. This content needed to be fun and interesting for readers. It needed to include concrete names, terms and nouns for search engines. I added Creative Commons photos with specific names to attract search traffic. Creative Commons graphics tend to attract clicks. I gave the lens a visual makeover and an easy-to-grasp navigation bar passing traffic between all the quizzes in the series. I also improved all the other lenses linked to it, so they’ll reinforce each other. Ued my method of On-page search optimization to discover popular, relevant searches with low competition, then add those phrases to the lens. Also reworded some content using related searches (semantic SEO) discovered through Google “related search” and “Wonder Wheel”. Added links to my challenge lens from other lenses. Sometimes I used Featured Lenses module. Other times I created links within the text of other lenses, because “anchor text” is useful for SEO. Added a link to lens from Livejournal profile. User profiles on other websites usually aren’t strong backlinks, but they can’t hurt. Created a notepad to keep track of all improvements, ideas, and results. I included screenshots of starting traffic stats and LR for a baseline. Built a few backlinks: from an older Gather.com article I wrote on a related topic, from existing Cafepress shops related to the topic. Made a new Cafepress shop featuring one of the better photos on the lens and linking to the lens from the shop with a blurb written to appeal to the shop’s audience. Loked for lenses by others in the same niche and examined their Squidoo tags. If they were good lenses, I added those tags to my lens. This helps build cross-links. Oct 12 (Day Three): Today I had plans and failed to execute some, but still got some acomplished. Verified that my old myth-related blogs and main lensmaster squidcast were syndicated at least on Feedburner. Posted an announcement/PR about the lens on my two related blogs. Started to take Fluff’s advice on Yahoo Pipes. I got bogged down here! Built links from a few more related lenses. I didn’t just drop the links. I tailored them to those lens’ audiences. One lens gets traffic from students, so on the link I referenced it as a study guide; the other lens gets traffic from people looking for images, so I referenced the Creative Commons images. Visited more people’s lenses — community matters too! Oct 13 (Day Four): RSS Time! Following an example provided by Fluff, I created a Yahoo Pipe aggregating my Squidcasts from all my “Greeky Geeky” lenses: Odyssey and this series of quizzes. I submitted that RSS feed to Feedburner.com, using their settings to have it ping automatically. I submitted the Feedburner feed to several RSS Feed sites suggested by Fluffanutta. I wrote a couple new Squidcasts to populate the feed and made sure it was working! Visited some more people’s lenses — I hope nobody minds; I left feedback in case it might help with the challenge! So far I’m getting likes from Squidoo traffic (thank you!!!!! ), visits, and a few comments. I’ve seeing search engine traffic for phrases I added to the lens in the last few days. No Digg or SU traffic. I’m seeing traffic from Livejournal. Not too much yet, 18 yesterday and 14 so far today, but that’s better than the 0-3 it was before. That’s only good enough for a tier 2 lens; it’ll need more. I’m not seeing clickouts apart from clicks back to SquidU. That’s partly because the new content is so new; I haven’t seen image search traffic arrive yet. ETA: Someone gave me a purple star. Now THAT will give it a huge boost. Of course, it will only last two weeks, but maybe by that time search engine traffic will have picked up! Finish revamping the last two of the nine lenses in the series so they all are pulling in search engine content. Armchair hobbyists with some insider knowledge of topic. See if I can improve the quiz questions anymore. That is after all what people are there for! Improve graphics, presentation, pictures a little more. Maximize clickouts: identify what people are searching for and provide it. 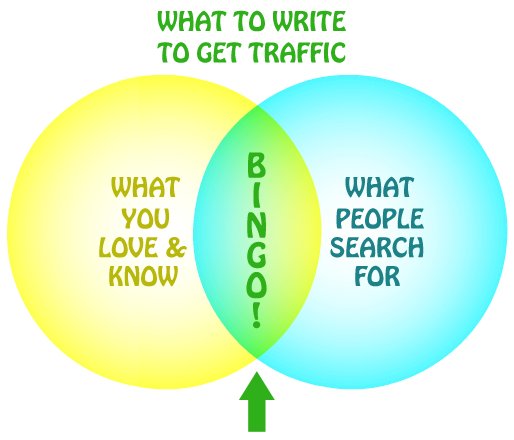 Use traffic stats results to help determine what people are searching for. Keep monitoring traffic stats and reacting. More disciplined keyword research and use. Refine other lenses in series. Add links from Flickr account, since I have photos related to the topic! And in general add links from places I have a presence around the web. Get back to working on Greece Odyssey — it’s a source of cross-links too! Look for communities or places that might be interested in the lens (e.g. my alma mater’s alumnae forum). I’m very wary of being a link spammer, though. Posted in: Experiments and Challenges, Squidoo. Thanks for the suggestions, and for the links to the backlink info on Google. Noted in a post on my new Squidoo blog!